1. Put the onion, garlic, rice, beans, thyme, coconut milk, 100ml water and half the red chilli in a pan. Season, bring to the boil, then cover and simmer gently for 25 minutes. 2. Mix the jerk paste with half the lime zest and juice, then rub all over the pork steaks; set aside to marinate. Chop the remaining red chilli and put in a bowl with the mango; toss with the remaining lime juice and zest. 3. Heat a griddle pan over a high heat and cook the pork chops for 4-5 minutes on each side. Uncover the rice and stir in the peas, cooking for 2 minutes until warmed through. 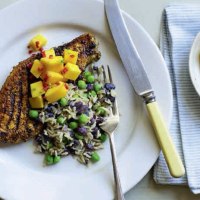 Serve the pork with the rice and mango salsa.